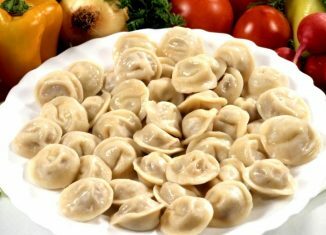 Pelmeni are dumplings consisting of a filling wrapped in thin, unleavened dough. The dough is made from flour and water, sometimes adding a small portion of eggs. The filling can be minced meat (pork, lamb, beef, or any other kind of meat), or fish. The mixing together of different kinds of meat is also popular. The traditional Udmurt recipe requires a mixture of 45% beef, 35% mutton, and 20% pork. Various spices, such as black pepper and diced onions as well as garlic, are mixed into the filling. 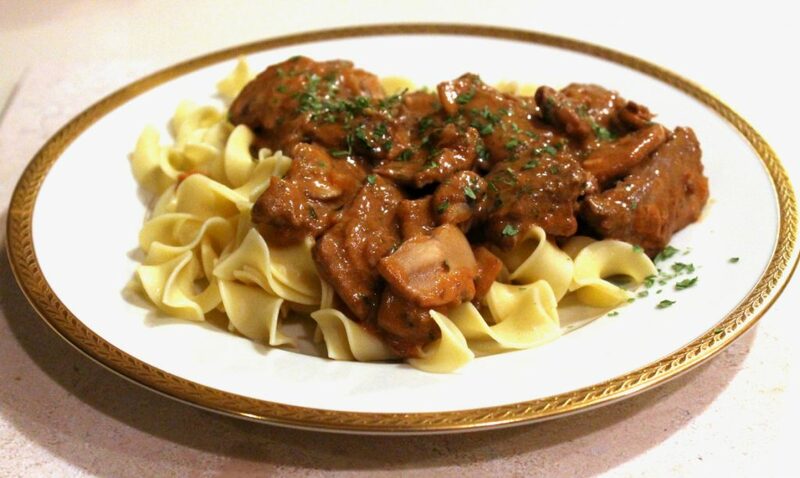 Beef Stroganoff or Beef Stroganov – Russian dish of sautéed pieces of beef served in a sauce with smetana (sour cream). From its origins in mid-19th-century Russia, it has become popular around the world, with considerable variation from the original recipe. 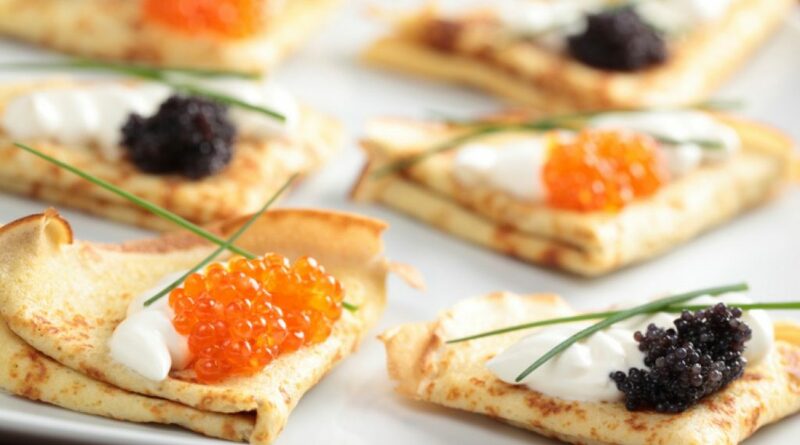 A blini (sometimes spelled bliny) or, rarely, blin (more accurate as a single form of the noun), is a Russian pancake traditionally made from wheat or (more rarely nowadays) buckwheat flour and served with sour cream, quark, butter, caviar and other garnishes. It should not be confused with blintzes, also known as crepes or palatschinke. Pilaf is a dish in which rice is cooked in a seasoned broth. In some cases, the rice may attain its brown or golden color by first being sauteed lightly in oil before the addition of broth. Cooked onion, other vegetables, as well as a mix of spices, may be added. Depending on the local cuisine, it may also contain meat, fish, vegetables, pasta, and dried fruit. Pirog is a baked case of dough with a sweet or savoury filling. Pirogi are common in Eastern European cuisines. Pirogi are characterised as “the most popular and important dish” and “truly national goods” of Russian cuisine, “ubiquitous in Russian life”. 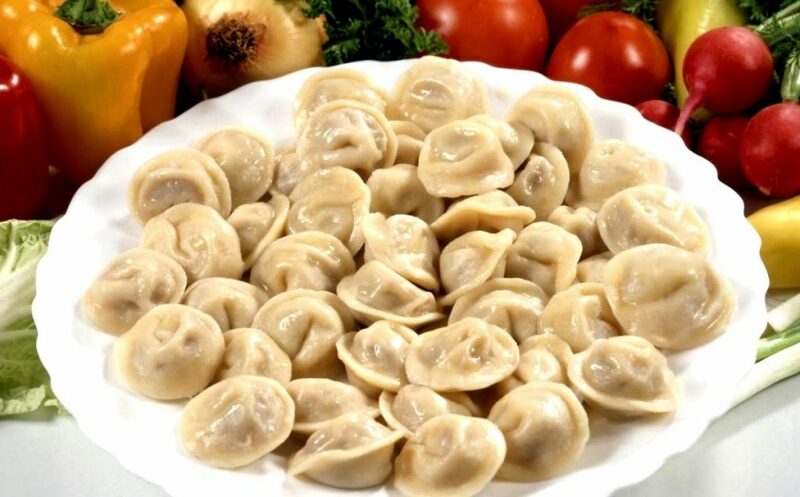 The Russian plural pirogi with the stress on the last syllable should not be confused with pierogi (stress on “o” in Polish and English) in Polish cuisine, which are similar to the Russian pelmeni or Ukrainian varenyky. Olivier salad is a traditional salad dish in Russian cuisine, which is also popular in many other European countries, Iran, Israel, Mongolia and also throughout Latin America. In different modern recipes, it is usually made with diced boiled potatoes, carrots, brined dill pickles, green peas, eggs, celeriac, onions, diced boiled chicken (or sometimes ham or bologna sausage), tart apples, with salt, pepper, and mustard added to enhance flavor, dressed with mayonnaise. In many countries, the dish is commonly referred to as Russian salad, although this term can connote vinegret. 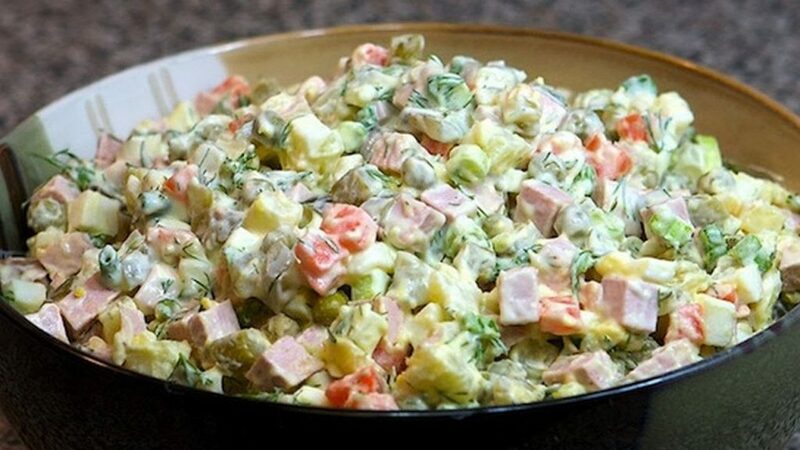 A variation called Stolichny salad exists, and is also popular in the Russian cuisine. 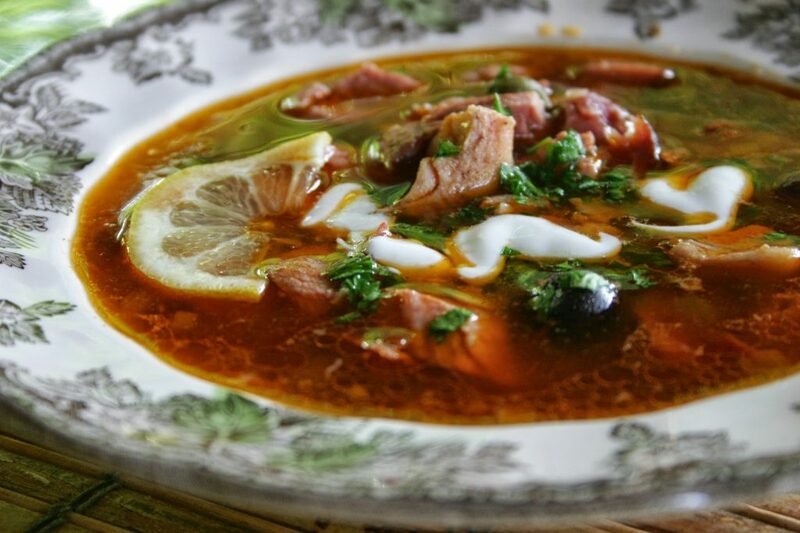 Solyanka is a thick, spicy and sour Russian soup that is common in Russia and other states of the former Soviet Union and certain parts of the former Eastern Bloc. There are three basic types of solyanka, with the main ingredient being either meat, fish, or mushrooms. All of them contain pickled cucumbers with brine, and often cabbage, salted mushrooms, potatoes, smetana (sour cream), and dill. The soup is prepared by cooking the cucumbers with brine before adding the other ingredients to the broth. 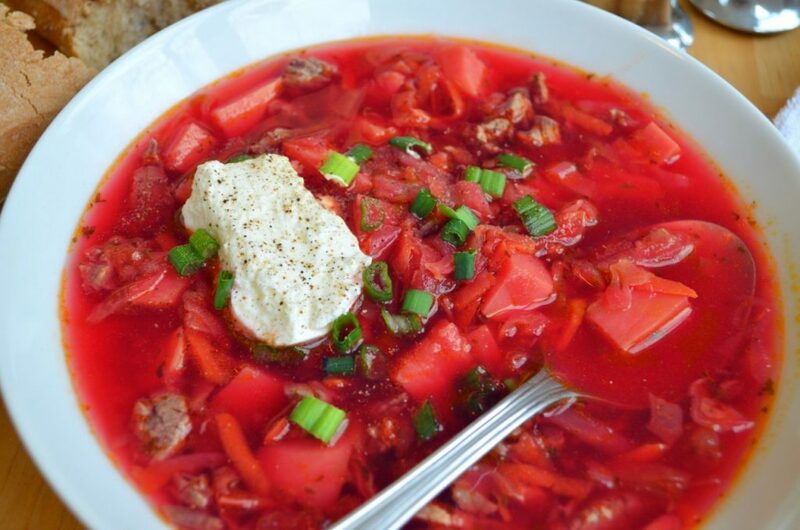 Borscht is a sour soup popular in several Eastern European cuisines, including Ukrainian, Russian, Polish, Belarusian, Lithuanian, Romanian and Ashkenazi Jewish cuisines. The variety most commonly associated with the name in English is of Ukrainian origin and includes beetroots as one of the main ingredients, which gives the dish a distinctive red color. It shares the name, however, with a wide selection of sour-tasting soups without beetroots, such as sorrel-based green borscht, rye-based white borscht and cabbage borscht. 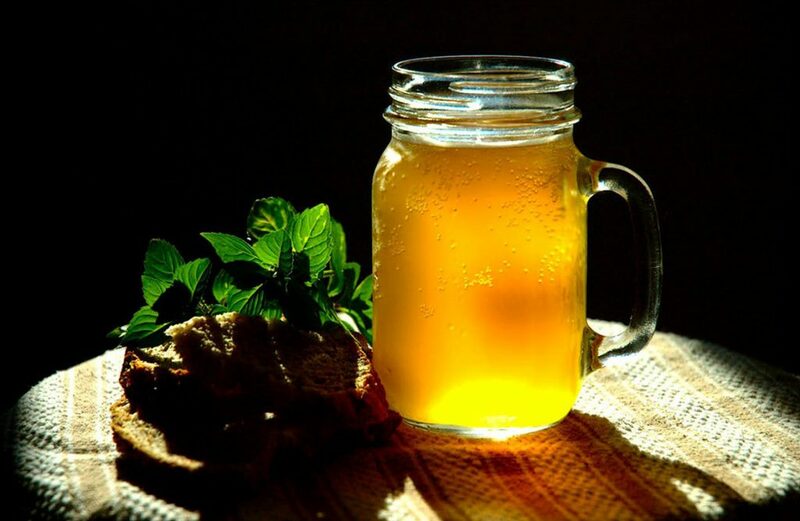 Kvass is a traditional Slavic and fermented beverage commonly made from rye bread, known in many Eastern European countries and especially in Ukraine and Russia as black bread. The colour of the bread used contributes to the colour of the resulting drink. It is classified as a non-alcoholic drink by Russian standards, as the alcohol content from fermentation is typically low (0.5–1.0%). It may be flavoured with fruits such as strawberries and raisins, or with herbs such as mint. Golubtsy is a cabbage roll (also popular in Polish cuisine – known as Gołąbki) made from lightly soft-boiled cabbage leaves wrapped around minced pork or beef, chopped onions, and rice or barley, which are baked in a casserole dish and are usually served with a sour cream or creamy tomato sauce. 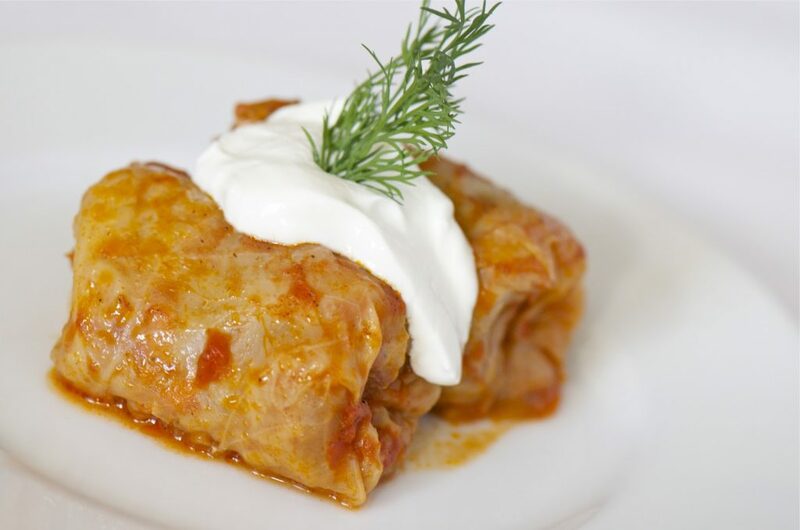 The Russian version of cabbage rolls usually consists of mincemeat mixed with cooked rice or buckwheat wrapped in cabbage leaves and stewed in a mixture of sour cream and tomato sauce. In order to save time there is another variation of that dish called “lenivye golubtsy” (lazy cabbage rolls). In that case, the cabbage is chopped and mixed with mincemeat and rice so there is no need to wrap every meatball in a cabbage leaf. 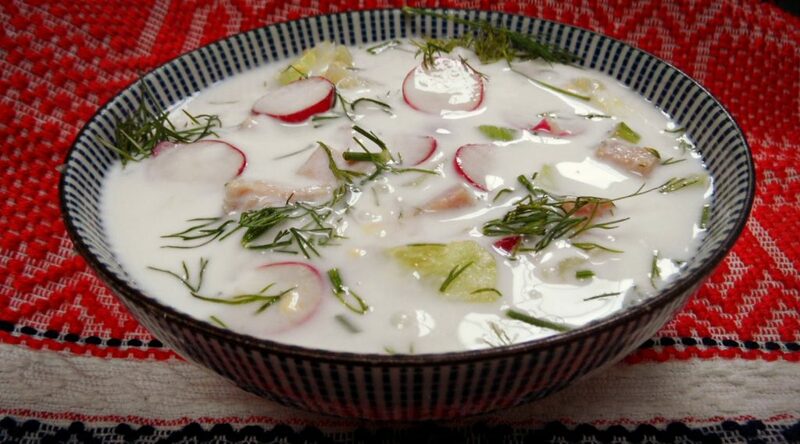 Okróshka is a cold soup. The classic soup is a mix of mostly raw vegetables (like cucumbers, radishes and spring onions), boiled potatoes, eggs, and a cooked meat such as beef, veal, sausages, or ham with kvass, which is a non-alcoholic (1.5% or less) beverage made from fermented black or rye bread. Okroshka is usually garnished with sour cream (smetana). Later versions that appeared in Soviet times use light or diluted kefir, whey, vinegar, mineral water, or even beer instead of kvass. The ingredients are diced and then mixed with kvass just before eating; the ratio of chopped food to kvass is similar to that of cereal to milk. This allows the vegetables to retain their texture. For that same reason, even though the ingredients are similar to those in a Russian salad, the taste of okroshka is quite different from that of the salad. Okroshka is mostly served in summer because the soup combines the refreshing taste of kvass and the lightness of a salad. Salt and sugar can be added according to taste. 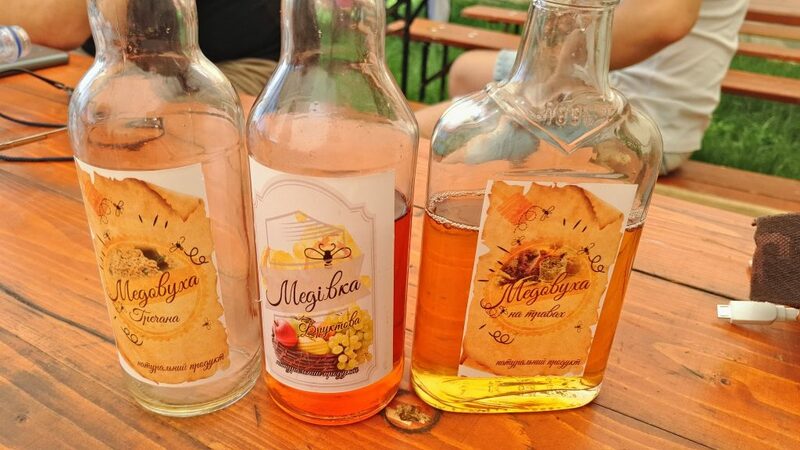 Medovukha is a Slavic honey-based alcoholic beverage very similar to mead but cheaper and faster to make. These two words are related and go back to the Proto-Indo-European *médʰu (honey). Known in Eastern Europe since pagan times, it remained popular well into the 19th century (unlike in Western Europe, where mead is traditionally associated with the Middle Ages). Jellied chopped pieces of pork or veal meat with some spices added (pepper, parsley, garlic, bay leaf) and minor amounts of vegetables (carrots, onions). 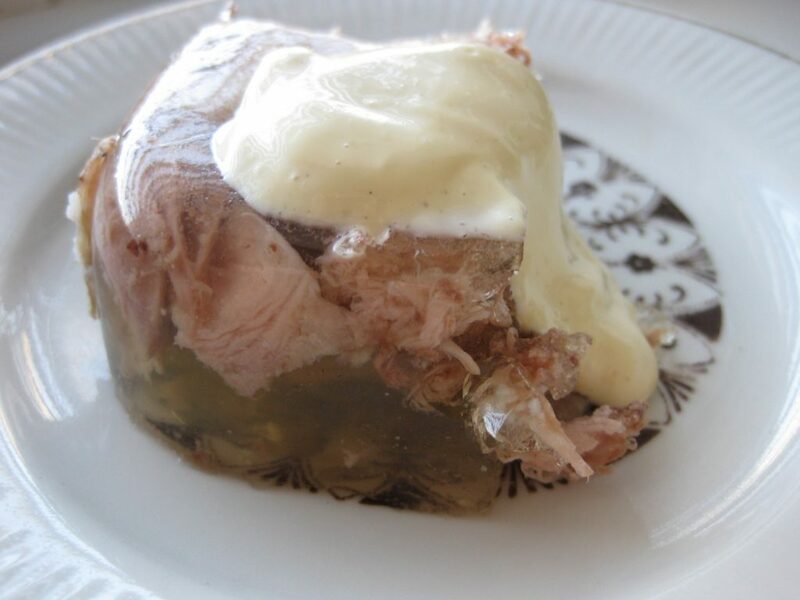 The meat is boiled in large pieces for long periods of time, then chopped, boiled a few times again and finally chilled for 3–4 hours (hence the name) forming a jelly mass, though gelatin is not used because calves’ feet, pigs’ heads and other such offal is gelatinous enough on its own. It is served with horseradish, mustard, or ground garlic with smetana. 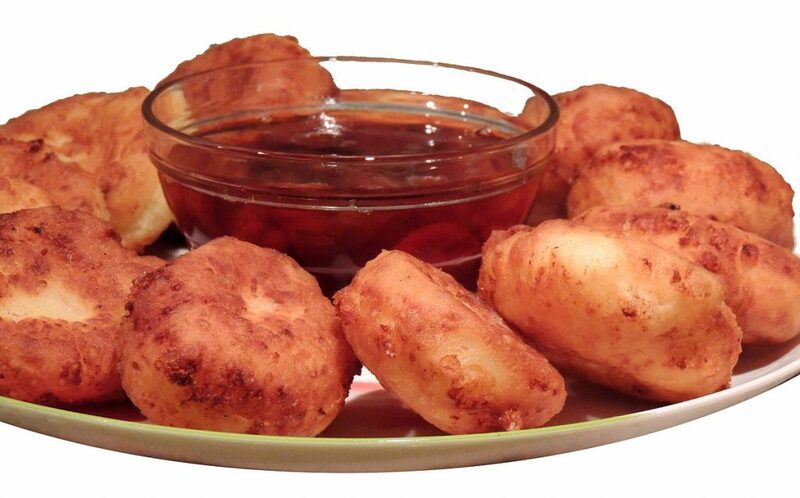 In Russian, Belarusian, Latvian, Lithuanian, Serbian and Ukrainian cuisines, syrniki are fried quark pancakes, garnished with sour cream, varenye, jam, honey or apple sauce. The cheese mixture may contain raisins for extra flavour. In Russia, they are also known as tvorozhniki (творо́жники). Syrniki with raisins Syrniki are made from creamy quark, mixed with flour, eggs, and sugar, sometimes adding vanilla extract. The soft mixture is shaped into cakes, which are fried, generally in vegetable oil. 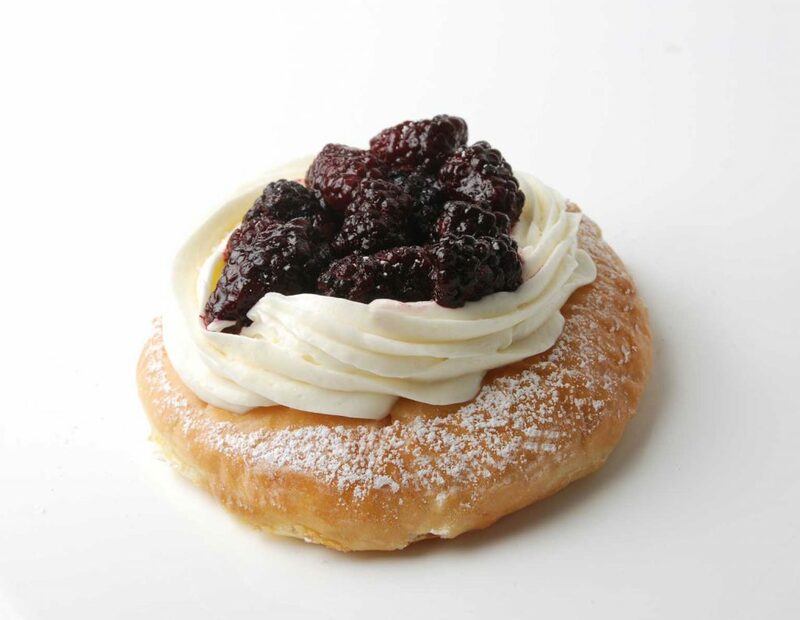 The outside becomes crisp, and the centre is warm and creamy. They are sweet and served for breakfast or dessert. Their simplicity and delicious taste have made them very popular in Eastern Europe. 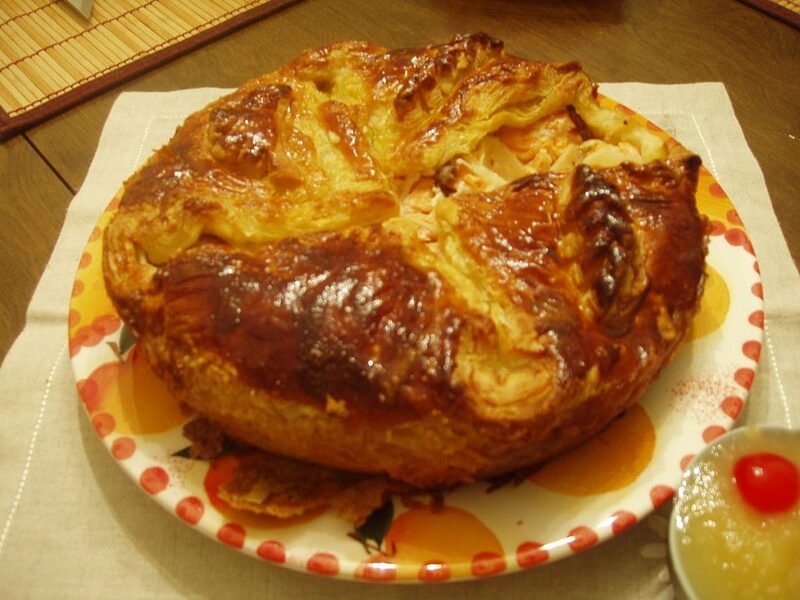 Vatrushka is an Eastern European pastry (pirog) formed as a ring of dough with quark in the middle, sometimes with the addition of raisins or bits of fruit. The most common size is about five inches in diameter, but larger versions also exist. 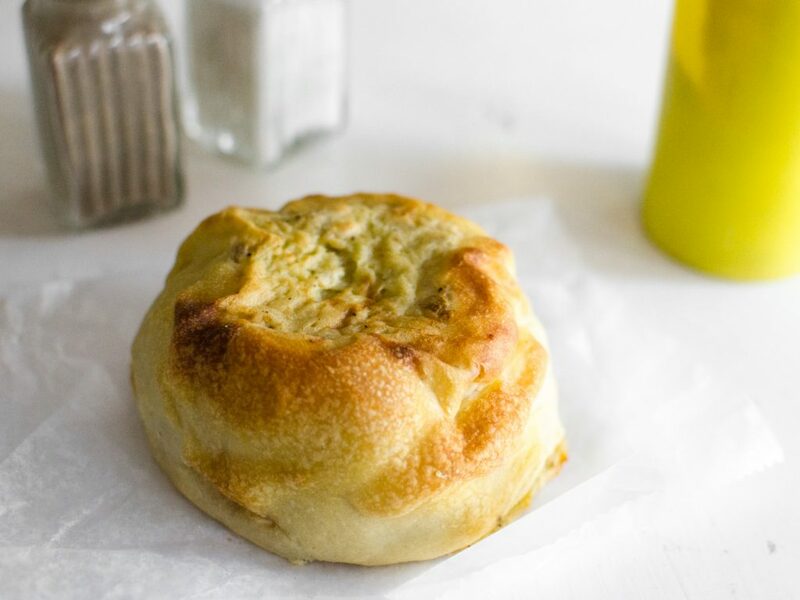 Vatrushkas are typically baked using a sweet yeast bread dough. Savoury varieties are made using unsweetened dough, with onion added to the filling.